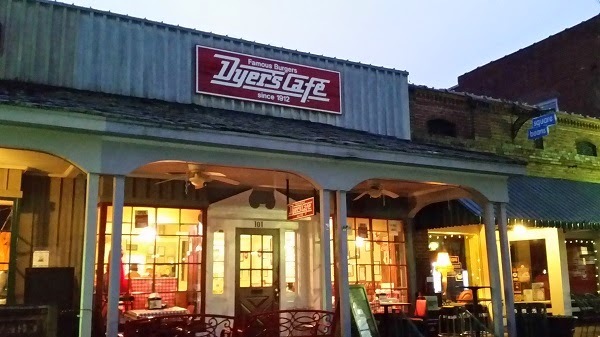 Dyer’s Cafe, Collierville TN – Marie, Let's Eat! In 2012, Mark McMinn celebrated the hundredth anniversary of Dyer’s by moving the restaurant – the version that he owns, anyway – further out east from Memphis, to the town square of a lovely, sleepy little suburb called Collierville. There has been some pushing and pulling as to whose is the one, true Dyer’s, because there’s another restaurant by that name in downtown Memphis, on Beale Street, pulling in the tourist dollars, but after I read Hamburgers & Fries: An American Story by John T. Edge, I figured that the McMinn-owned Dyer’s was the one to visit. He says that his father, Kahn Aaron, worked for “Doc” Dyer in the 1920s and bought the restaurant from him in 1935. 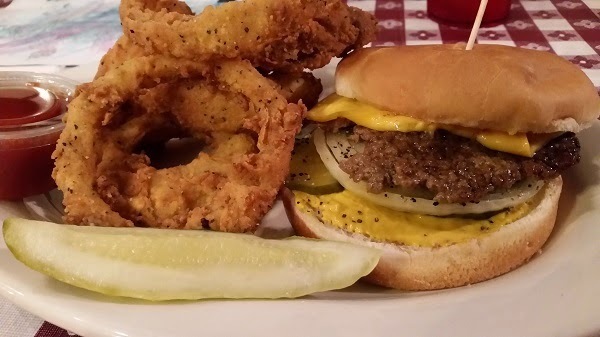 The specialty at Dyer’s is deep-fried hamburgers, and the legend suggests that they’ve never completely changed the grease, so that some of the “molecules” in it are more than a hundred years old now. They’re typically served with mustard, onions, and pickles. The flavor is something like the small fried burgers that you can get at the Hamburger Wagon in Miamisburg OH. They’re really tasty. I’d love to eat here more frequently, especially with these onion rings on the menu. So I asked the waitress, or I started to, “Are the onion rings—” and she interrupted, “Amazing. They’re amazing.” And I appreciated her honesty. These rank among the very best onion rings that I’ve ever had. Everybody else in our group was fairly pleased with their suppers at Germantown Commissary and had desserts here. The milkshakes and pies went over really well, but unfortunately they’d already sold out of the apple pie that Marie’s brother Karl was hoping to try. 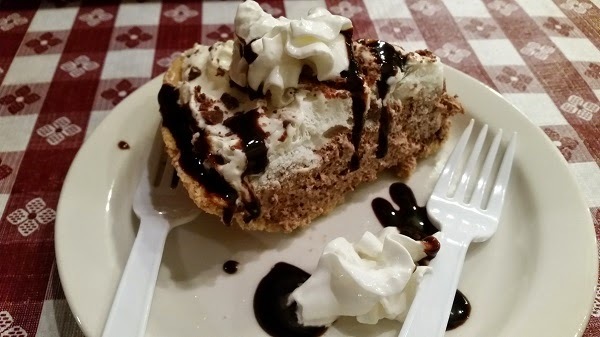 Marie had the Hershey pie, which was, like many of the other things on the menu, homemade. We suggested that to our daughter, after a boxed pie-shaped rendition of that treat elsewhere in Tennessee had disappointed her a couple of weeks previously, but she was so scarred by that experience that she took comfort in an orange creamsicle shake instead. Dyer’s Cafe is awfully quiet on Sunday evenings, but we sure do appreciate them being open for travelers on tight weekend schedules. The present location has only been open for three years, but it looks at least a little bit older, just a classic, locally-owned small-town restaurant with really good food and excellent service. Maybe it doesn’t look quite 103 years old, and maybe you can’t genuinely detect 103 years of molecules in the grease, but it’s certainly worth a visit anyway for a juicy burger, tangy onion rings, and a milkshake. Posted on April 24, 2015 August 21, 2017 by Grant G.Posted in burgers, memphis, tennesseeTagged burgers, collierville, dessert, memphis, onion rings, tennessee.